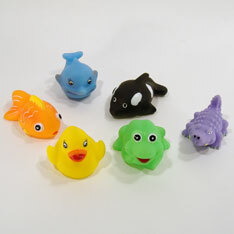 Soft squeezable squirt toys in aquatic forms. Fabulous Tub or pool toys! Squeeze to load. Squeeze to squirt. What could be simpler? Bright colors. Average 3 ½ inches. Sold by the dozen. Bagged 1 dozen. $5.75 per dozen for 20 dozen or more. $4.95 per dozen for 40 dozen or more.